Forget about frozen pizzas and fish sticks. Vegan and dairy dinners can be the healthiest, yummiest and yes, most filling of all. We may abstain from meat for the 9 days, but that doesn’t mean denying your family good, hearty food. Lucky for you, this blog is chock full of all you can eat in the 9 days. And for a bonus, the recipe below can be modified to suit your family’s tastes and your fridge’s contents. Remember Choose Your Own Adventure books? Well, here you go. 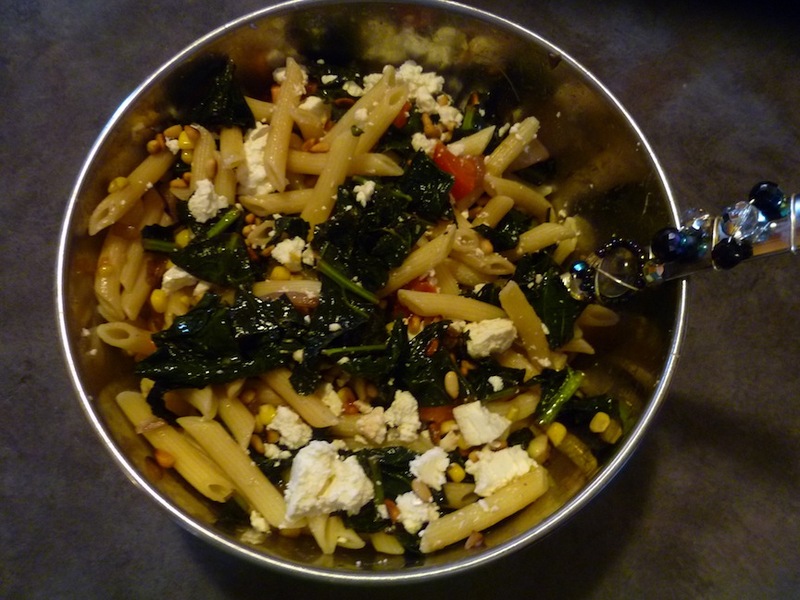 Pasta topped with sauted chard, fresh tomatoes, roasted pine nuts and feta. Once you get then hang of this, you’ll make dinner in minutes. And you can vary this dish so much, you could enjoy it every night. Leftovers? Build them into tomorrow’s dinner. That is, unless you gobble them up for lunch. Prepare the grain according to directions. Dry pan roast your nuts, if you’re using them. Place nuts in a dry pan over medium-high heat, shaking the pan every minute or so. The cooking time depends on your choice of nut. Almonds take a few minutes, pine nuts are ready in 2 minutes or so. Prepare your protein. For tempeh, crumble or cut into strips and saute over oil or butter on medium heat until brown, flipping to brown the other side. Add 1T chili powder, 1/2t salt and Tabasco sauce to taste for a Mexican flavor or add only soy sauce for an Asian flavor. For tofu, coat tofu pieces with soy sauce and olive oil and let it marinade for a few minutes. Broil for 10 minutes on each side. 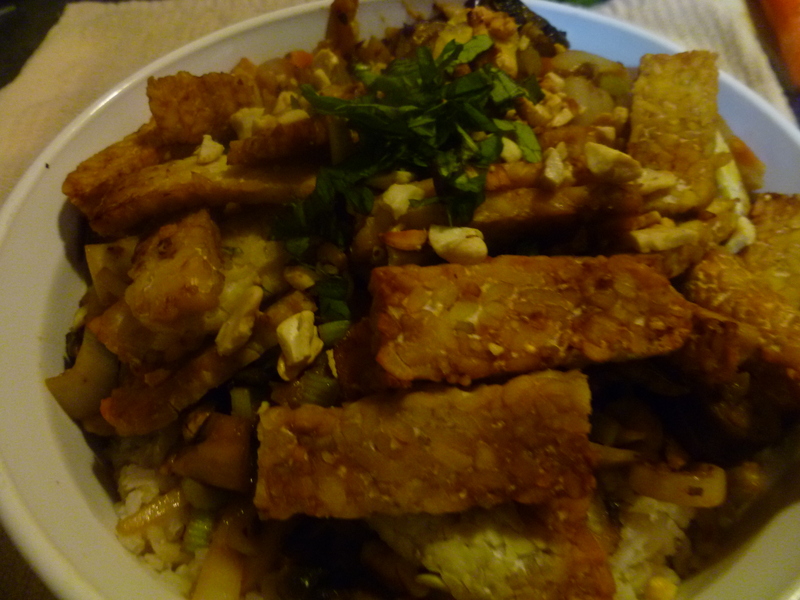 Fish can be prepared in the same way as the tempeh and tofu. Add butter or oil to a large pan. I use a lot, like 3T, because this needs to flavor your vegetables and grain. Saute onion or shallot over medium heat (until lightly brown about 5 minutes). Add garlic and vegetables that take a longer time to soften. 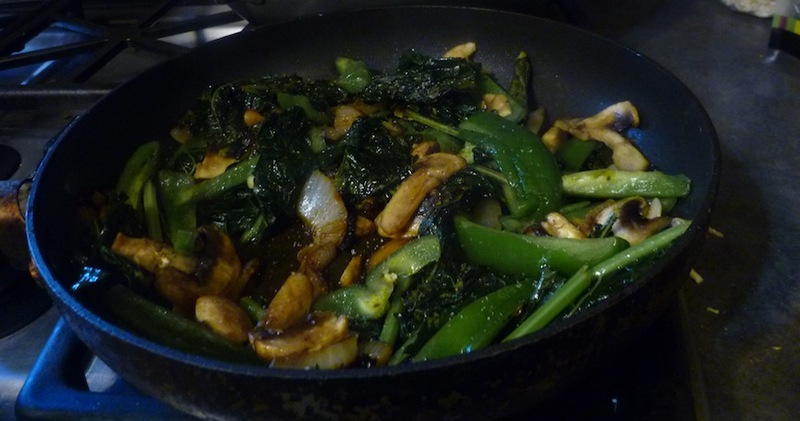 (For really fibrous veggies, like collard greens, I add about 4T of water and cover the pan for a few minutes. Wait until the water evaporates to move onto the next step.) Add quick cooking veggies, like scallions and the mushrooms. Stir in flavoring. Add the grain to the pan and let cook while stirring 1 more minute. Top mixture with fresh vegetables, if you’re using them, and tofu, tempeh, fish, nuts or cheese. Enjoy! Dinner will never taste the same twice. Nice pix. The tempeh looks tempting.